To end this tidal wave of guest posts, I would like to introduce a new blogging buddy of mine whose skills excels no matter what she bakes (though let me admit, she is a Baker By Nature ;)) – Ladies and gents, put your hands together for your final fabulous guest blogger, Ashley! I’m Ashley, and I run Baker by Nature . I’m utterly thrilled to be guest posting here today. And I’ve saved something very special for you. Excited? Muffins! As you can plainly see – duh! The special part is what you can’t see. These dark chocolate beauties are more than meets the eye! Underneath that gorgeously dark chocolate muffin mask lies an intensely healthy interior that will leave you feeling guilt free and fully indulged. Let’s get started! Our double chocolate kick comes from cocoa powder and dark chocolate chips – decadent! Our coconut flavor comes from coconut milk and coconut oil – rich and creamy! When you’ve got flavor like this, the fact that they’re healthy is really just an added bonus. Did I mention there’s no sugar included in these? Agave takes care of that for us. Thanks, agave! 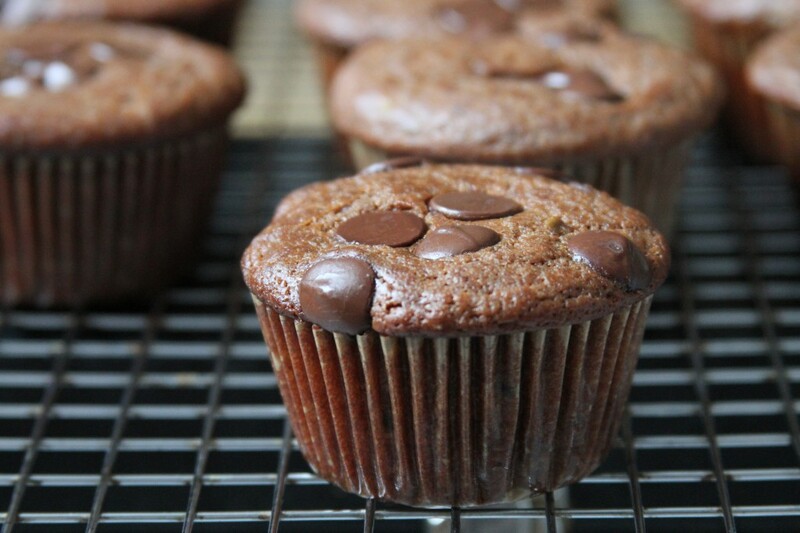 Just make some muffins… you know you want to! In a large bowl, mix eggs, oil, milk, agave, and vanilla together, set aside. 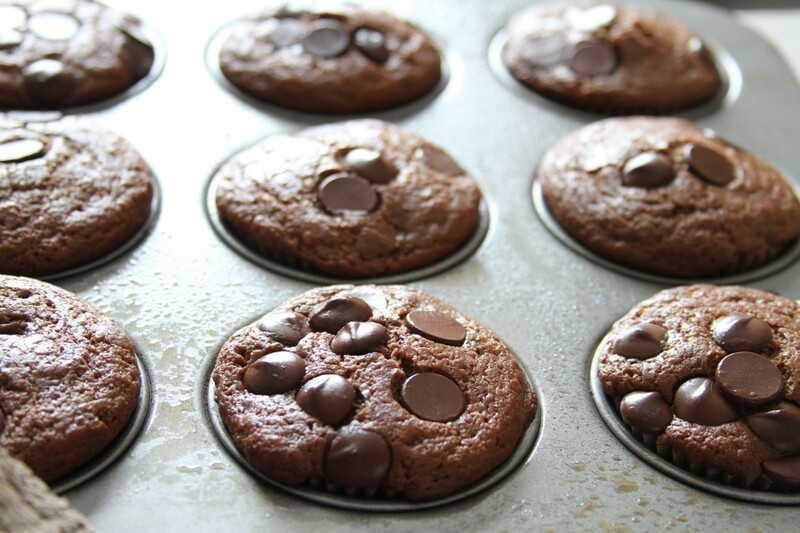 Mix cocoa powder, flour, salt, 1/2 cup of chocolate chips, and baking powder together. In 3 sections, mix the flour combination into the wet ingredients, stirring only until all ingredients are incorporated. Plus they are healthy and involve chocolate? A dream come true 😀 – Thank you so much Ashley, truly these muffins and guest post are much appreciated and salivated over 😉Want Ashley to make all your baking dreams come true? Simply visit her gorgeous blog today! Wow, these muffins look great! Thanks for sharing! We’ve just started a blog about food, fashion and lifestyle – if you’d like to check it out, please do. We’re definitely going to follow yours! these look amazingly delicious! i guess i need to start filling my pantry with some new ingredients! OMG, these are simply gorgeous! Those chocs are making me real hungry now! Nice mtg u, Ashley! I love anything coconut! I love Ashley’s blog and this recipe. Chocolaty goodness!! they are really simple but they look amazing! Dairy free 😀 I love it!!! WOOOFF these look sooososoo good. Muffins, that too without sugar!! How exciting!! Love it!! these look incredible, love the double dose of coconut going on in these! That looks absolutely fantastic! Thanks Ashley and Uru! I am in for these muffins, what more without sugar. These will be a perfect treat for me. These sound so exotic with the agave and coconut oil–and they look so cute and perfect!! I need to invest in some coconut oil so I can make these!! What’s better than a chocolate muffin? A double chocolate coconut one! Love this recipe, interesting use of coconut oil! Coconut and chocolate–two of my favorites! These look so good, no sugar?! Sounds impossible, but I bet they’re great. I ought to try these ou some time! I think I want to make this soon (weekend maybe?) because I luv it. Thanks for sharing.. I love Ashley and her blog! Great to see her as your last guest post. Both chocolate and coconut are my favorite. These muffins look so good, just like everything else she bakes! Great looking muffins!! They look very nice and manageable. Yummy bite sized ones 🙂 Wow! I feel like i haven’t been here in a while CCU! haha.. Now you’re already almost back to blogging! 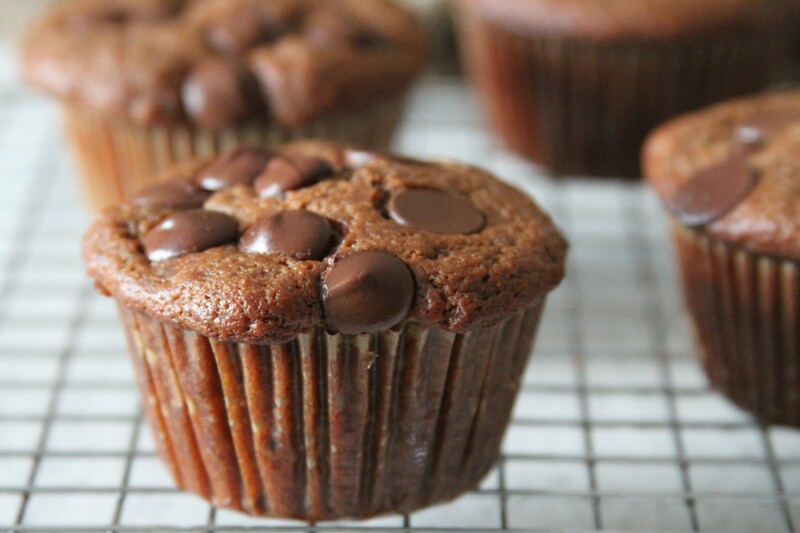 These muffins are beautiful and can’t believe they’re healthy, too. Thanks CCU, for introducing us to all of these great bloggers through their guests posts. Good luck with finals and we look forward to seeing you back in the kitchen again. Chocolate and coconut…I think I’m in love. A great final guest post! Chocolate and coconut are divine together… in a “good for you” recipe, to boot. Congrats on finishing Year 11 in style, too, Uru! oooh I love how you can still see the chocolate chips melted on the to- looks perfect! I’m happy (not groaning) upon the announcement of your return—yaaaay!!! and what a great idea to pair coconut + chocolate!! Really good photos! And a nice recipe. Great guest post – good way to end the guest posts. I’ve enjoyed them all, but I’m eagerly anticipating what you’ll be cooking up for us when your exams are over! I love these “decadent “, which really pretty healthy, with the coconut milk and oil, as well as agave. A winner for sure! What a fantastic recipe! Love that it has no sugar. Those gooey chocolate chips on top look so luscious! As a big fan of agave, I’m excited to see what it’s capable of in these treats. Ashley, these muffins look and sound delicious! Great use of agave. Thanks for sharing. Sooo yummy! Can’t believe these are sugar free. Wow. I love that these are no sugar and made with coconut ingredients. These are all my current fave things! And good luck on exams! So happy you have been able to stick around! Hit those books and we’ll see you soon! Amazing recipe. I love love love the use of Agave in here. Delicious! Love the combo of chocolate and coconut! This is definitely a keeper, Ashley. When I read coconut and chocolate… and muffins (!).. I knew I had to come ogle these. They sound great and look fabulous.. I TOTALLY want to get into muffin making mode this autumn- starting with these. 🙂 Thanks for the awesome recipe, Ashley! Chocolate and coconut?! Yes yes yes!! Double chocolate and coconut sounds like a winning combination to me. Interesting, no sugar muffins? Never used agave before so will have to go investigate! These look just amazing! What a great post to end the blogging hiatus for you, CCU 😀 Congrats on the end of exams !! Looking forward to more yummy posts :). wishing you both great week!!! OMG these look so delicious, so decadent and I love that they’re healthy!!! Yay coconut oil!!! Wow, gorgeous and healthy! Love these. I wish I could reach in and have one right now! Possibly two!! They look so delicious! I love the usage of coconut milk and oil. Excellent baking! Love the use of coconut milk! Delish! Who wouldn’t want these chocolaty gems to start their day! They look amazing! Just bought a big jar of coconut oil and am looking for recipes that use it. This post came at such a perfect time. Thanks for sharing! good luck with your exams! 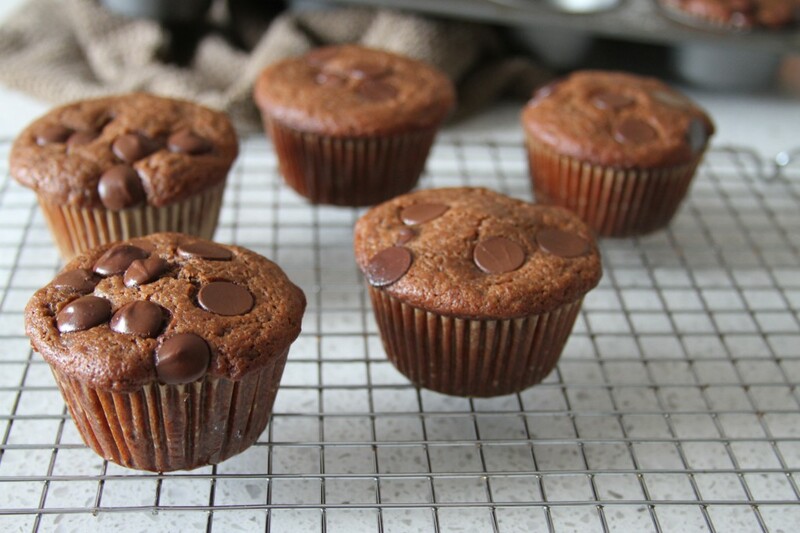 Guest posts are always refreshing and this muffins look awesome. Congrats on finishing your name, CCU! And what lovely luscious muffins. Makes me feel like having a bite right away. Great to see Ashley here! I love that these muffins have no sugar! Coconut and chocolate are such a fantastic combination. Lovely recipe! No sugar chocolate muffins? This sounds very interesting to me. Now I want to learn more about agave. Very nice baking, Ashley!